I started to learn blacksmithing in 1999 and I am a full time swordsmith since 2006. 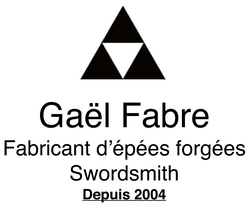 I am specialised in the forging of sharped swords and saber made of laminated/damascus steel. Here, you could find different examples of pieces that I made for my customers. Examples that can be customized. Every sword I make is a unique piece.